Tampa Divorce Lawyers | Caveda Family Law Firm, P.A. The dedicated Tampa divorce attorneys at Caveda Law Firm, P.A. strive to relieve some of those uncertainties by building a clear picture of the options available to you and the potential outcomes. We support you throughout all aspects of divorce, including child custody, support and alimony, property and asset division, and with enforcement and modification of arrangements as needed. Divorce is one of the most sensitive and complex areas of the law, requiring an experienced legal partner. The divorce lawyers at Caveda Law Firm, P.A. have been supporting Tampa families for over 25 years, and are ready to do the same for you. Call Caveda Law Firm, P.A. today at (813) 336-5690 for a Free Consultation with a Tampa Divorce Lawyer! Sometimes, relationships have reached a point where collaboration is no longer an option. Either communication has completely broken down or the parties simply can’t agree on a fair solution. Their case is then taken before a judge who will have the final decision regarding all aspects of the divorce. During a contested divorce is when a skilled divorce attorney can provide the most support. Caveda Law Firm, P.A. works to reduce your stress by providing their extensive legal expertise to work for you. The divorce of active and retired members of the military have a number of issues not found in standard divorce proceedings. There are federal guidelines regarding asset division, specifically regarding military pensions. 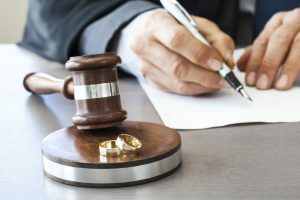 The “Ten Year Rule” is also frequently misunderstood, with spouses having an inaccurate understanding of what they can expect from their military divorce. With a military and legal background, divorce lawyer David Caveda is uniquely prepared to handle this type of divorce effectively and efficiently, with a firm understanding of the specific laws and how they impact you and your case. Caveda Law Firm, P.A. is dedicated to providing you with outstanding legal support. Whether you are considering divorce or responding to a divorce summons, our family law firm protects your rights and delivers the best possible results for you and your family.